The Los Angeles Lakers are resting, almost shutting down Kobe Bryant, and still Byron Scott can’t find the minutes for Jeremy Lin to spend a significant amount of time on the court. Regardless of those inner problems, the Portland Trail Blazers with Damian Lillard in the vanguard handled them with ease en route to a 106-94 win. Brant was sitting in “civilian” clothes close to the bench. He’s more banged up then he’d like to admit. Racing to beat Michael Jordan has taken a big toll out of him, although according to Byron Scott, Bryant didn’t want to play so many minutes. It doesn’t really matter. The facts are this: Bryant isn’t playing, and the Lakers need him. Not the chucking, ball hogging version of him, but of the guy who commands attention from a defense but looks for a pass first, or at least tries to make the best decision. 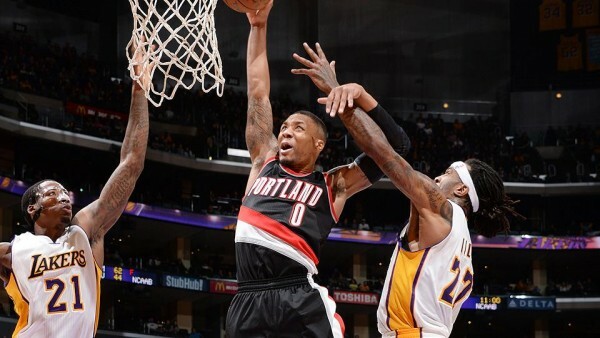 Without him (or with him, it wouldn’t have mattered) the Blazers enjoyed their second win in seven days over the Lakers. Why was it easier this time? Bryant didn’t play in the four point loss. What changed? Nick Young going ice cold from the bench made a difference, scoring only 9 points on 3-of-11 from the bench. Yet Young is this team’s best scorer, and giving him just 18 minutes cripples them even further. Lin played only 19 minutes. Why? No one knows. Scott has his own agenda and preferences. As his admission about the whole Bryant situation tells us (although we already knew), he’s not very good at realizing who is actually good for this team and who doesn’t, or what to do in order to get the best out of his own players. Lin scored 9 points to go with 3 assists, as once again a very good game of his is followed by what feels like getting punished. It was interesting to hear the confession from Byron Scott about his part in Kobe Bryant now being potentially shut down. Maybe he’s taking a bullet and hiding something else, but according to Scott, it was him that insistent on Bryant playing 37 minutes a night and not getting any rest, before finding out that even great players break down at some point, especially when they’re old (in basketball terms) and not as great as he thought they’d be. If Bryant is shut down, the Lakers giving him that massive extension has to become one of the worst deals in the history of sports, isn’t it? It’s only for two years, but taking a player they know is in the twilight of his career and isn’t someone with the patience to play on a losing team and giving him the highest salary in the NBA is incompetence, blindness and a few other words that a thesaurus can help you locate. It’s not that he’s such a great success even when playing, but at least he’s been changed into a more efficient version, one that doesn’t hurt the Lakers as much, that can actually be of use this season. Playing without Kobe Bryant isn’t the end of the world, but it’s another loss for a team that’s had to do without too many key players since this season began, losing Julius Randle on opening night and Steve Nash to a back everyone knew was going to plague him with pain this season. Byron Scott calling the shots from the sidelines is the bigger problem – for the team and also for Lin specifically. It seems that even leading the team to wins doesn’t give him credit in Scott’s eyes, which can probably be quite disheartening and demoralizing to someone who is more than occasionally their best player on the floor.